Xiaomi Mi MIX 2 is one of the latest smartphone that its presence is quite anticipated, considering the first generation of this smartphone is able to attract the attention of many people as sliding last year. 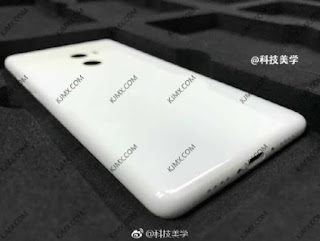 Leaks about this second generation also had leaked by Mi MIX designer, Philippe Starck. The French designer uploaded the Mi Mix 2 concept video on his Facebook account. The video uploaded proved to be very popular, where it has been watched hundreds of thousands of times. It certainly can not be separated from the full-screen design that has super-thin bezel on all sides. This full-screen design is in demand for this year, where several smartphone brands present their flagship smartphones with full-screen designs, such as LG G6, Galaxy S8 and Note 8, and the coming iPhone 8. According to rumors, Xiaomi Mi MIX 2 will come with a thinner design than the first generation Mi MIX. Although the front panel is the main attraction of the Mi MIX 2, but recently appeared leaked photos that allegedly show the rear panel Xiaomi Mi MIX 2. Although we can not determine whether this is really the back panel Mi MIX 2, but the apparition Two vertical holes in the back remind us of the first generation Mi MIX. Two vertically arranged holes on the first generation Mi MIX consist of a camera lens for the upper and lower fingerprint sensors. While Mi MIX 2 is rumored to be coming with a dual-camera setup. If the rumor is true, then the two holes will be a dual-camera setup, so there is no more room for the fingerprint sensor on the back. If Xiaomi does not use the fingerprint sensor on the back, of course the other alternative is to apply a fingerprint sensor embedded in the smartphone screen or 3D face recognition. In addition, it is not known what kind of material used for the back panel, whether ceramic or metal. Xiaomi Mi MIX 2 itself is expected to slide on 12 September.